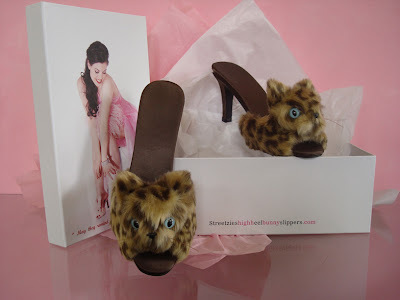 Have you ever heard of Streetzie's High Heel Bunny Slippers? Neither had I, until last month, when the designer gifted a custom made pair of Silver Wolf Cub Slippers to burlesque star Dita Von Teese, who shared them with the world through her Twitter account. Intrigued, I visited Streetzie's website, where I found her adorable satin and synthetic fur bunny slippers for sale, but alas, no kitties in sight. However, I figured if she made wolf cubs for Dita, perhaps other animals couldn't be far off, and bookmarked the page for future reference. Fast forward to this weekend, when I randomly stopped back for an update, and discovered that Streetzie recently revealed that she'd created five, one of a kind Kitten High Heel Mules for The Magic Fashion Convention is Las Vegas! She says, "The level of craftsmanship and detail that went into the making of these will not be duplicated when manufactured later this year. A simpler variation will be mass produced instead...but won't be available for some time." A few of the prototypes (pictured) were put up for sale on eBay for $85.00 - $95.00 (sadly the auctions are already over), but presumably, the manufactured versions will sell at around the same price point as her bunny slippers, which range from $39.00 - $59.00 a pair, when they are finally released. Stay tuned for more updates on how to purchase these purrfect plush kitten heels to wear in your own boudoir as they become available! Love 'em & love they are synth fur! Oh those are so cute! We think that everyone should have a pair! We think we'll have to get one of those for our Mom! Love them!